Pase un día bebiendo tintos y blancos franceses en la región vinícola de Saint-Emilion y Pomerol. Saliendo de Burdeos, visite dos castillos para degustar los famosos vinos de la región y pasear por las hermosas calles de Saint-Emilion, declarado Patrimonio de la Humanidad por la UNESCO. Salga de Burdeos en un autobús con clima controlado y viaje al norte a dos regiones vinícolas: Saint-Emilion y el Pomerol. Este último se encuentra dentro de la zona de Libournais. Cerca de Saint-Emilion, visitará un castillo, la palabra francesa para “castillo”, para una cata de vinos guiada. Descubra cómo factores como el suelo y el clima se combinan para dar características distintivas a las uvas de vino, y cómo éstas contribuyen al sabor del vino. Aprende qué uvas crecen mejor en esta área y crea los famosos vinos de Burdeos. 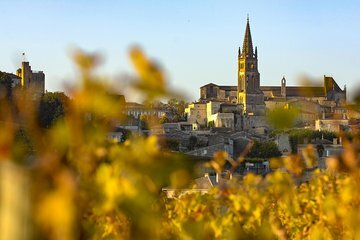 Luego, diríjase a la ciudad de Saint-Emilion, donde podrá explorar este excepcional Patrimonio de la Humanidad por la UNESCO durante un recorrido a pie de 45 minutos. Después de eso, disfrute de tiempo libre para ver la ciudad por su cuenta, haga algunas compras y almuerce (por cuenta propia). La última parada de su recorrido es una finca vinícola en el Pomerol. Pruebe más vinos durante una cata de vinos en un chateau Grand Cru Classé. Obtenga más información sobre el proceso detallado de elaboración del vino durante un recorrido por las bodegas y la bodega antes de subir al autocar y regresar a Burdeos. Un día completo!! Y una guia excelente!! Wat een leuke wijn tour was dit! Angie is een ontzettend enthousiaste gids en vertelde honderduit. We bezochten erg originele, kleinschalige chateaus. Een van de rondleidingen werd gegeven door de wijnmaker zelf! Mooie wijnen geproefd. Heel charmant! In St. Emilion zelf kreeg je wat tijd om zelf te gaan lunchen, heel leuk om wat tijd te hebben om het plaatsje zelf even te verkennen. Ik zou het zeker aanraden! Great group, Julie was an excellent tour guide (and driver!) and the chateaux were gorgeous. The wine was great and we were lucky enough to meet a handful of owners and winemakers. Definitely recommend! Our guide met us exactly at 9:30 in front of the Tourist Office. I highly recommend you have a hard copy of your reservations, as it makes asking questions easier since it can be a bit chaotic. There were 8 of us on the tour with a single/driver guide, whose English was flawless, in a 9 passenger minivan. He took us to 2 wineries in the morning where the guides there explained about the wines. It wasn't so much a tasting trip, but more of an education about the region, AVAs and wine making techniques. 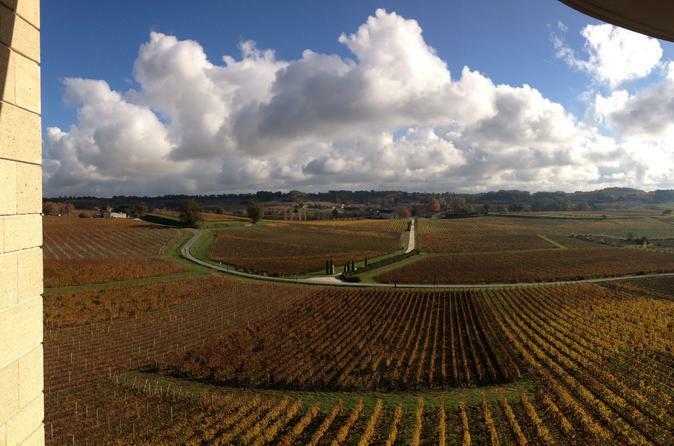 When we visited Saint-Emilion, we made the mistake of taking a long lunch. We should have read up more on this village and spent time exploring it. After lunch, we went to one more winery and then headed home. The wineries were presented in the order of lowest to highest and offered a variety of different histories, wines and winemaking techniques. Although we visited during crush, we never felt rushed and were shown the actual grapes being sorted and crushed. I came away more informed about wines from Saint-Emilion and am not so intimidated by them. Karim our guide was so focused on our enjoyment and was always wanting to ensure each person was happy. This tour was fantastic. Beautiful sites, great chateaus and our tour guide, Simon, was simply awesome. Great balance between sightseeing, learning the wine making process, and getting to enjoy the process of wine tasting. Simon was very knowledgeable, friendly, and made the tour extremely enjoyable. I would highly recommend this to anyone. Our fantastic guide Karim made this tour an unforgotable one! He was great, a lot of fun and very knowledgeable about the wine region and different types of wine, We visited 3 wonderful family owned wineries in saint Emilion and Pomerol. The medieval town of saint Emilion is lovely, very charming place, we enjoyed lunch there.If i could rate this tour 10/10 , i would, it was fantastic, thanks again to our guide Karim, his sense of humor was extremely entertaining and warm. He made everyone in the car feel included! Highly recomend him for the tour..
Our tour guide was very knowledgeable about the wine making in the region. I learned a lot!! The 3 vineyards we went to were very different, which was great and meant there wasn't too much repetition between them. The medieval town of St Emillion is lovely. the only challenge the day I was there was that there were some cruise ship tour groups there. And also many of the less touristy restaurants were closing about the time our second wine tasting was ending so it was a bit difficult to find a restaurant for lunch. Fantastic trip!!!!! Guide was very entertained me and friendly. The stops on this tour are amazing and the day is just log enough. One warning- if you purchase wine, shipping to the US was very problematic when purchased in St-Emilion at the shop. Might want to carry home.